Established for visually impaired students in 1845 under leadership of John Motley Morehead. Present plant is 500 yards north. The Governor Morehead School, North Carolina’s school for the blind, opened in 1845 as the North Carolina Institution of the Deaf and Dumb and the Blind. The initiative, a state-supported educational program for children with disabilities, was one of the first in the South. The idea originated in 1843 when William D. Cooke, the head of Virginia’s School for Deaf and Dumb Instruction in Staunton wrote to Governor John Motley Morehead suggesting that North Carolina could start a school of its own. Morehead, known as an advocate for education and for the disabled, leapt at the idea, and offered to bring the matter to the attention of the Presbyterian Synod at its next annual meeting in Raleigh the following year. After receiving the support of the Synod, Morehead turned his attention to the state legislature. On January 8, 1845, the legislature approved an act “to provide for the education of the poor and destitute deaf-mutes and blind persons in this state.” Four months later, on May 1, the school opened in a building located two blocks west of the Capitol in Raleigh, with four teachers and 23 deaf students between the ages of 8 and 32. The pupils were given instruction in reading, writing, mathematics, history, geography, the arts, and the Bible. Four years later, a legislative appropriation allowed for the purchase of a new building on Caswell Square in Raleigh. In 1851 blind students began enrolling in the school. William D. Cooke, who left the Virginia school to take charge of North Carolina’s institute, established vocational classes including shoemaking and sewing. His students became the first deaf students in America to produce a newspaper made for and by the deaf, the Deaf Mute Casket. By the end of 1858 the school had 39 deaf and 18 blind students. During the Civil War, the school remained open. However, two faculty members left for service with the Confederate army and for a brief time the pupils were employed in making musket parts. From June 1865 until January 1866, the school closed in part because of a lack of supplies to feed the students. At the conclusion of the Civil War, efforts were made to address the need for a school for African Americans with disabilities. The United States War Department offered to find and rent housing if the North Carolina Institution for the Education of the Deaf and Dumb and the Blind would supply teachers and instruction. The school opened on January 4, 1869, in a building rented from the American Missionary Association with 21 deaf and 7 blind students. It was the first institute in the nation for African American blind students. By the late 1880s, enrollment at the white school exceeded the facility’s abilities, requiring the General Assembly to appropriate funds for the establishment of a separate facility for the deaf students. The new school opened in Morganton in 1894. While white blind students remained at Caswell Square in Raleigh, the black deaf and blind students remained at their school on South Bloodworth Street. All three were overseen by John E. Ray, appointed principal of the North Carolina Institution for the Education of the Deaf and Dumb and Blind in 1896. Under his tutelage, the school system became the largest of its kind in the United States, boasting 535 pupils in 1912. In 1905, the institution changed its name to the State School for the Blind and Deaf. Eight years later, the General Assembly made appropriations to move the school for white blind students to the current location on Ashe Avenue in Raleigh. In 1929, the Assembly appropriated more funds to move the school for African American blind and deaf students to Garner Road. 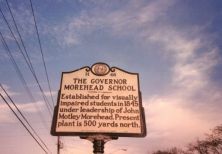 Thirty years later initial talks were held about consolidating the two Raleigh schools, and in 1963 the name was changed to the Governor Morehead School in honor of John Motley Morehead. Four years later, in 1967, the General Assembly approved moving black deaf students to the traditionally all-white deaf school in Morganton, and the following year began the consolidation of the schools for the blind in Raleigh. By 1971 the consolidation of the black and white blind student school at Ashe Avenue was completed, and the following year the Governor Morehead School received reaccreditation by the Southern Association of Colleges and Schools. The modern Governor Morehead School remains the state’s premier institution for the education of the blind in North Carolina, and provides both education and residence for visually impaired students from preschool through age 21. Musicians Doc Watson and Ronnie Milsap are alumni of the school.